Lone giant surrounded by re-growth forest. A solid tree with superficial fire damage. All major limbs are dead with only a few small trunk shoots alive. Tree may not survive much longer. 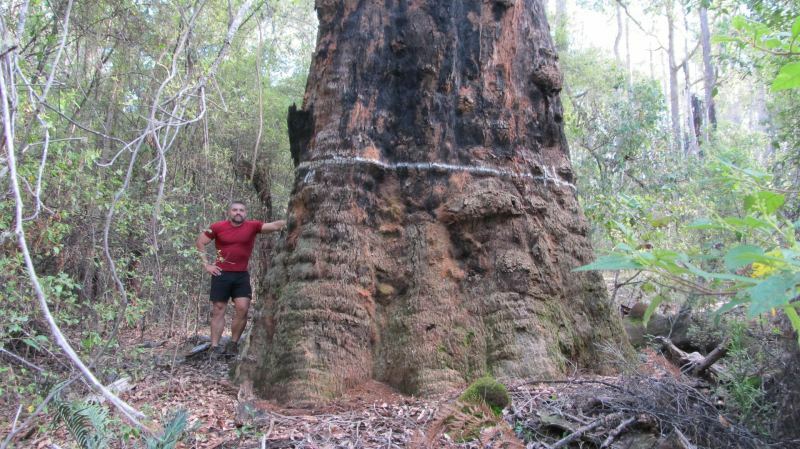 Main trunk splits at 27m. Was once nearly 50m tall. 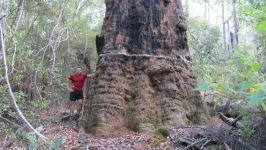 At 10m the trunk tapers unexpectedly, likely the result of a major limb weighing several tonnes breaking off. The area is completely covered by bark indicating that the tree healed long ago. Volume: main trunk 74.7m3, limbs 16.5m3. Total volume 91.2m3 - MAY have been 100m3 if all limbs were intact.